I admit that I didn’t use flea and tick protection for my dogs for a long time. In Western Washington, it used to be rare for us to run into fleas or ticks so we didn’t need to. However, that has been changing over the last few years. 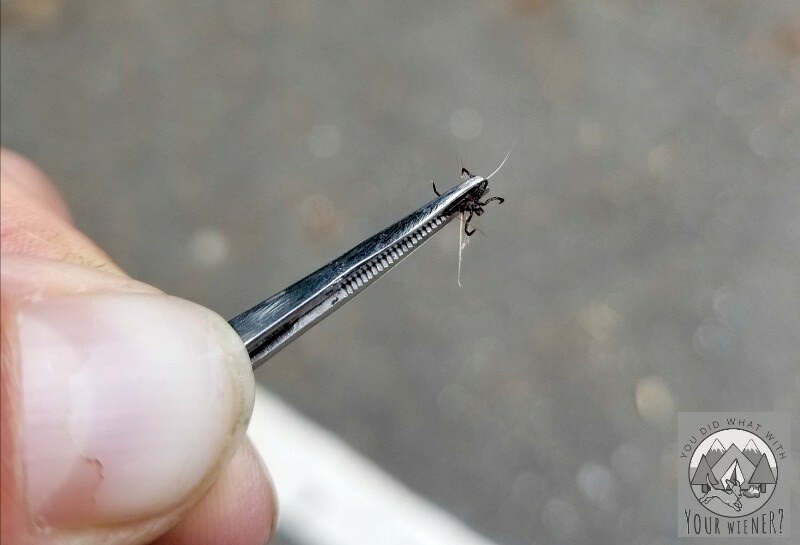 Today, the number of these pests has increased in the region so it’s more important than ever to protect your dog from flea and ticks if they venture outdoors. In the past, winter temperatures around Seattle usually dipped below the coldest temperature fleas can survive (37 F degrees) at least a few times a year so it helped keep the population in check. Our recent winters have been more mild though. In 2016, local veterinarians saw fleas make a return in January, which is significantly earlier than usual. Ticks were almost non-existent on the west side of Washington State when I was growing up. I actually never saw one in person until a couple of years ago. That’s changing too. The first time I saw a tick was after I took Chester and Gretel on a hike in a wooded, urban park. Never in a million years would I have suspected that Chester would get bit by a tick there but he did. I found it on him, fully engorged, the next day. Last year, Gretel and I went hiking on a trail that I would have never thought had ticks. It was on the west side of the Cascade Mountains and I’d never heard of someone finding a tick there. Gretel started itching when we got back to the car. I checked her over and found, to my shock, she had been bit by a tick. I worry most about ticks because they can transmit some scary diseases to a dog. Ticks can carry many diseases like tick-borne relapsing fever, lyme disease, and tick paralysis. However, even though I don’t think about it as often as I should, the problem with fleas goes beyond just being a nuisance. Not only can fleas irritate your pet’s skin, or cause anemia in dogs, they can pick up the Bubonic Plague from wild rodents and transmit it to a dog. I’ve decided that I can no longer be complacent when it comes to flea and tick prevention. I’m all for choosing a natural product when I can but sometimes there is nothing that does the job as well as a little bit of chemicals. I used to work at a large outdoor retailer and, personally, I’ve tried almost every natural bug repellent out there. In my opinion, absolutely zero of them worked as well as the chemical bug sprays like DEET and Permethrin. The natural repellents reduced the number of times I was bitten by bugs but they never stopped it. That’s been my experience with my dogs too. While natural repellents worked some when there were few bugs, I didn’t feel like Chester and Gretel were truly protected. Natural repellents knocked the annoyance down but they still got bit. All it takes is one bite from an infected tick or flea to spread a disease. 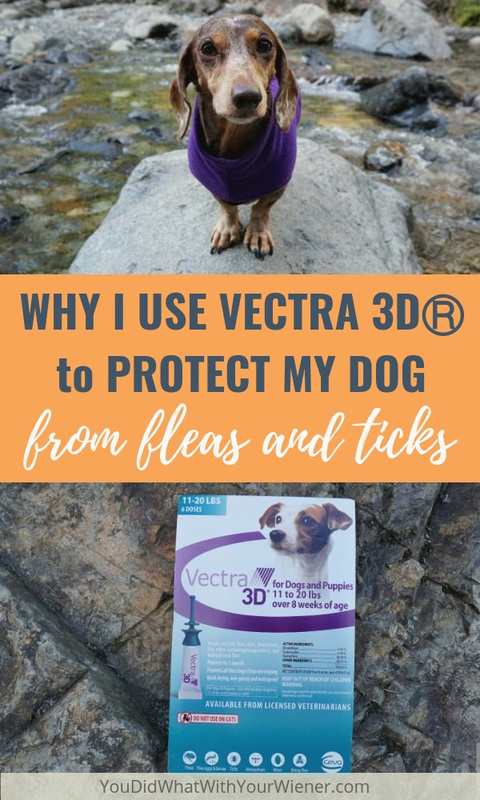 When it comes to protecting my dogs from diseases or illnesses caused from insects, I prefer to use something that I know will work in all situations.That’s why I chose Vectra 3DⓇ for dogs. 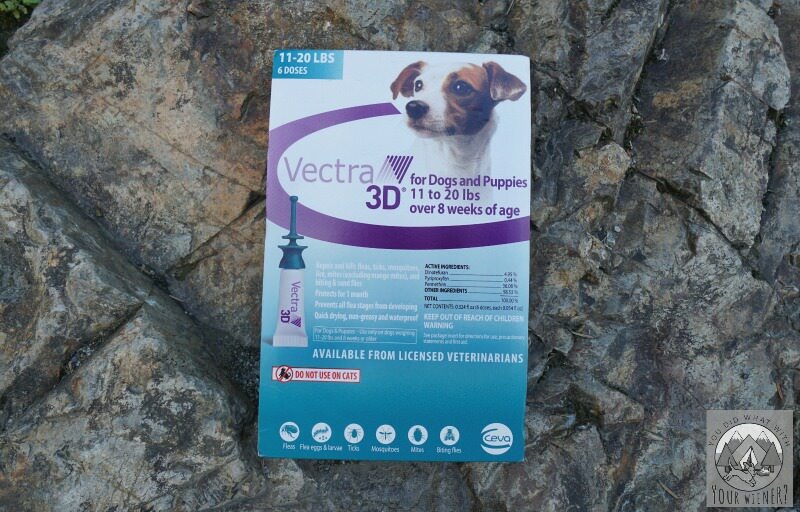 What is Vectra 3DⓇ for Dogs? 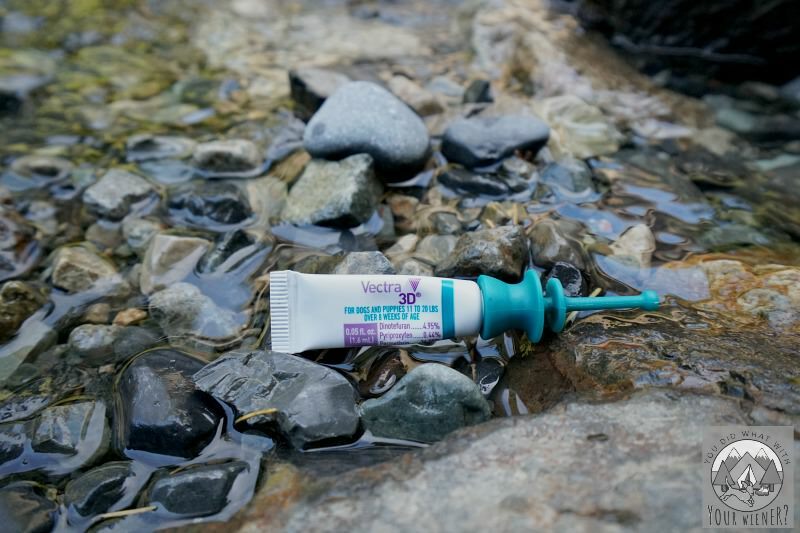 Vectra 3DⓇ is a topical treatment that repels and kills fleas, ticks, mosquitoes, biting and sand flies, lice and mites (excluding mange mites). What Are the Active Ingredients in Vectra 3DⓇ Flea and Tick Prevention? A primary ingredient in Vectra 3DⓇ flea and tick prevention is permethrin – a synthetic form of a bug deterrent found in nature. Vectra 3DⓇ is a triple-action formula because, in addition to permethrin, it contains Dinotefuran and Pyriproxyfen. All three ingredients work together to repel and kill fleas and ticks. Permethrin – Permethrin is a synthetic form of an insecticidal compound produced by the chrysanthemum flower and biodegrades quickly in contact with soil and water. Put directly on the skin, typically less than 1% of active ingredient is absorbed into the body. Dinotefuran – Dinotefuran disrupts an insect’s nervous system and results in the cessation of feeding within several hours of contact and death shortly after. mammals. It is specific for insects and does not bind to a mammal’s nervous system. It works through contact with the skin and is quickly eliminated from the body (in urine) if accidentally ingested. Pyriproxyfen – Pyriproxyfen mimics a natural hormone in insects and disrupts their growth, primarily affecting insects and eggs. It’s considered low in toxicity for humans and other mammals. 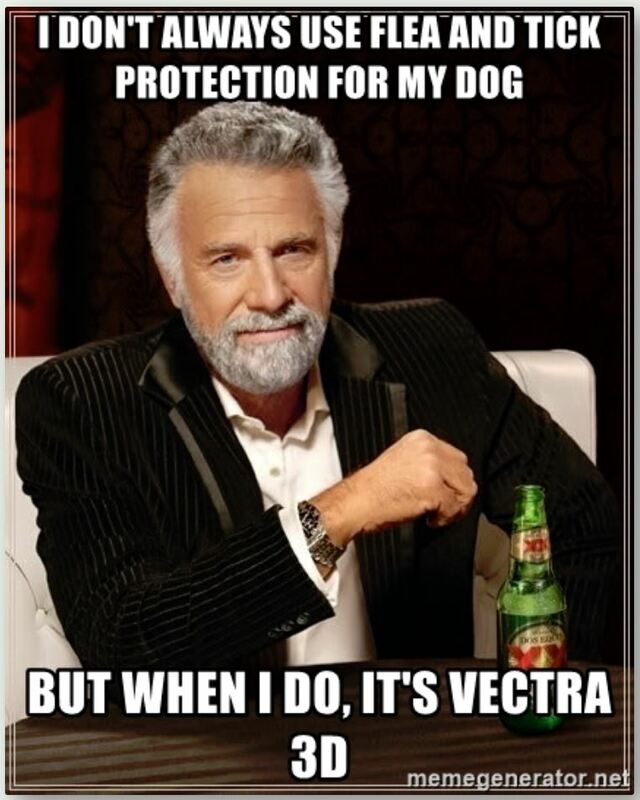 What Makes Vectra 3DⓇ the Best Flea and Tick Prevention for Dogs? It’s doesn’t just kill, it repels – While a lot of other topicals require that a pest bite your pet in order to be killed, Vectra 3DⓇ stops bugs before they even bite your pet (which is when many diseases are transmitted. It covers a larger range of pests – Many preventatives only kill fleas and ticks. Vectra 3DⓇ kills and repels 15 species of bugs including also kills heartworm-causing mosquitoes (which can transmit heartworm disease), biting flies, sand flies, lice and mites (excluding mange mites). What Are the Possible Vectra 3DⓇ Side Effects? There is a chance of side effects with most flea and tick treatments for pets, even when rare. Each pet, each circumstance, and the application of the treatment can vary so much from owner-to-owner. However, I always like to be aware what the risk are so I know to watch for those things. Also, a Vectra 3DⓇ clinical trial performed in 2007 found that owners saw fewer side effects with Vectra 3DⓇ than with K9 AdvantixⓇ, and it also found that Vectra 3DⓇ was easier to use (source. WARNING: It’s also very important to note that, because of the permethrin, Vectra 3DⓇ is toxic to cats so, for this reason, Vectra 3DⓇ must not be used on cats. This also means if you have cats in your household, they should be separated from any dogs being treated until the product has completely dried (for at least 4 hours). Because I don’t own a cat, this was not a concern for me. I’ve been excited to try Vectra 3DⓇ for years and it didn’t disappoint. Given that the most common side effects are not likely life threatening, and some of the diseases Gretel could contract from fleas or ticks ARE life threatening, I feel that any risk associated with using it are low. Gretel is only 10 lbs and we’ve been using Vectra 3DⓇ for 3 months with no side effects. I was prepared to stop using it at any negative sign but it looks like Vectra 3DⓇ is going to work great for us. 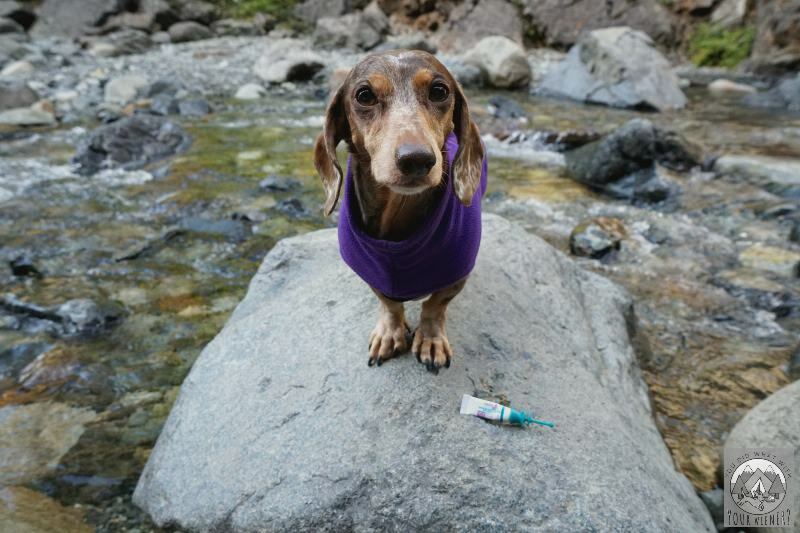 Like most topical flea and tick treatments, it comes in a little vial with an applicator. I like that it can be opened by simply pushing two little disks together – no scissors needed – and feel good knowing the rounded applicator tip is unlikely to scratch Gretel’s skin. I’ve felt more relieved on our hikes knowing that my dog is 100% protected from disease carrying bugs. I’m also happy we can visit local parks without worrying that fleas and ticks hiding where I least suspect will bite them. I would definitely recommend this flea and tick treatment to other dog owners. Disclosure: I was compensated by Ceva Animal Health/Vectra 3DⓇ in exchange for my time spent sharing information about their products. However, I was super excited about this product before we started working together. I don’t say nice things about a product out of obligation. Thanks for trusting me on that. This product is something new to me. As far as I concern when talking about flea and ticks prevention, 3 things come into my mind. Flea collar, shampoo your dog and some kind of spray. But my situation is the same as yours, I did not implement any kind of flea and tick protection for a long time. All I did I make sure my home is always in good condition, declutter everything, vacuum the carpet and all that. Furthermore, I regularly bath my dog with general pet shampoo. Anyway, thanks for the good review of this product. Maybe in the future, my dog has the same problem with ticks/flea so I can try it. Will Vectra last the full month even when i bathe my do weekly? I was reading that I shouldn’t use Shampoo that has degreasers in them. Do you or anyone else knows any shampoos I can use to give our dog a bath with and not remove Vectra? Hi Ramon. There are a lot of shampoos you can use that won’t remove Vectra. Their website says the treatment will last through “regular bathing” but, indeed, they do not list any shampoos that would be to harsh. To be safe, personally, I would stick with milder shampoos lke Johnson’s Baby shampoo, natural shampoos without detergents, shampoos that use coconut-derived surfactants, etc. There are a lot out there like that so I can’t even begin to list them all. However, you might consider Buddy Wash, Burt’s Bees, and Earthbath.